The bone, thought to be from dinosaurs called Iguanodon, was discovered by an associate of the public when they were looking among tree roots in their lawn. It was presented in by the anonymous discoverer to Sunderland Museum and Winter Gardens to see what their history experts made of it. Museum manager Jo Cunningham said it was an "amazing find". The museum's owner of geology, Sylvia Humphrey, identified the opportunity of the bone belonging to the Iguanodon species. She said: "It's really quite a challenge as to how the bone got there. Dinosaur bones are younger than the rocks of this area, as this place is on the Permian strata, which is 250 thousand decades of age. "The rocks of this region are far too old for it to have lain here, so it has been missing or decreased by someone in the last. "We think, although we can never be sure, that it is an element of vertebrae from an Iguanodon, and may start from the Wealden area." The Wealden is a stone development in the South East of England and it has historically produced many dinosaur fossils mostly that of Iguanodon-like creatures. Ms Humphrey approached specialists at the Natural History Museum in London, who confirmed the find is from the spine or tail of an Iguanodon-like dinosaur. Dr Angela Milner, from the Natural History Museum, said: “It is not finish enough to recognize it more specifically. 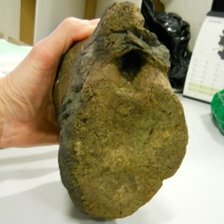 "The rocks around Sunderland are much too older to hold dinosaur bones so there are only two explanations as to how it got there - moreover by glacial transport or a one-time souvenir from the south coast of England where Iguanodon bones are not frequently discovered by fossil hunters." The Iguanodon, significance Iguana tooth, matured up to 10m extensive and walked the earth 130 to 115 thousand decades ago. It was the first dinosaur to be accepted by 19th Century doctor Gideon Mantell, who gathered Iguanodon teeth and bones. The museum said the bone discovered in Sunderland has similarities to material from a selection on present at the Great North Museum: Hancock in Newcastle. Jo Cunningham added: "We're very thankful to our museum visitor for providing this awesome discover in to us.”It will always continue a secret as to how it discovered its way there, and if they hadn't been looking up their garden it could have lain hidden." The dinosaur bone is now on present at Sunderland Museum and Winter Gardens.